Nothing says fall quite like a crisp, juicy apple. And when the harvest season arrives, it's fun to go for a Sunday drive to get some, fresh off the farm. Luckily, the Albuquerque area has plenty of apple picking orchards where the delicious fruits can be found. Unlike the east and west coasts where apple orchards can be found in abundance, New Mexico has a few select orchards and even fewer you-picks. Romero Orchards (below) still offers the chance to get out and pick your own. The other orchards will sell you apples in a number of varieties, but they are sold by the bushel. The former Dixon Apple Orchard near Cochiti and Tent Rocks National Monument was burned when fire swept through several years ago. It had been the closest you-pick to Albuquerque. Now you have to drive further north to do a real you-pick. But as anyone who loves apples knows, it isn't necessary to pick them yourself to enjoy their taste and flavor. Some of the orchards also sell cider, honey, and other food products. This family farm in Corrales offers an alternative to the crowds at the larger Wagner Farm. 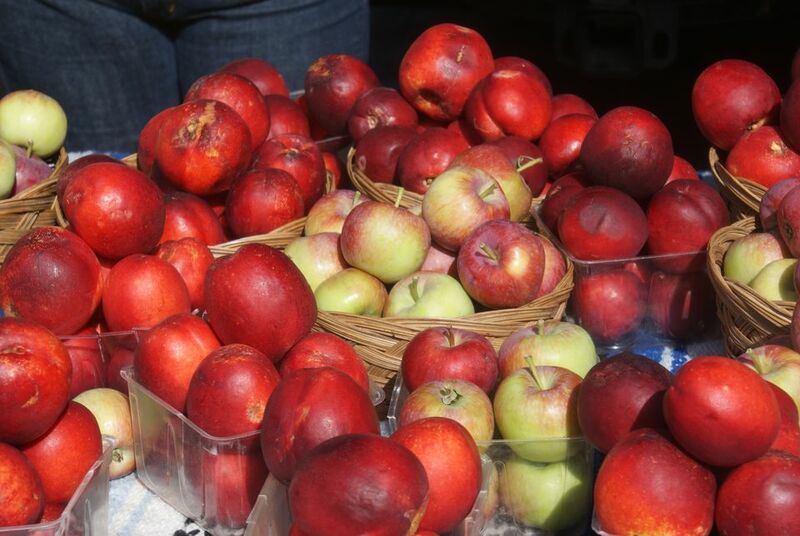 Alary Farms offers a variety of apples, to include Macintosh apples and apple cider. The opening is typically slated for mid-August, weekends only. They are open on some weekends in October. This is not a u-pick. This family owned and operated orchard has been a local favorite since 1962. They feature a variety of apples, including Gala, early golds, golden delicious, Winesap, Arkansas blacks, and more. The different varieties ripen at different times, so be sure to check their website to see which of your favorites will be available, and when. They sell honey and pollen by appointment. You can also pick your own apples. Besides having some of the most delicious honey locally, the apples at the Hays Farm are great too. Hays offers an easy drive south of Albuquerque to a beautiful location in Bosque Farms where there are apple varieties such as Gala, Crimson, Winesap and more. A great place to stop and get apples without the crowds. The Botanic Garden now sells fresh apples! A bumper crop of Rome apples can go home with you by the 14 or 7-pound bag. Fresh frozen grape juice from the grapevines is also for sale, by the half gallon. They' also sell mums. Apples, juice, and flowers are available while supplies last during the Harvest Festival. The high mountain temperatures make for delicious fruits. The Manzano Mountain apple store is open Thursdays through Sundays. Pick up apples and apple cider. Those who love cider can pick some up at the Manzano Orchard corporate office in Albuquerque, located at 7120 Wyoming, Suite 5. Manzano is typically open weekends in October until supplies run out. Romero's has apples for sale in the beautiful Embudo Valley, just north of Santa Fe. You can typically stop by seven days a week during apple season. You pick them yourself, by the bushel or half or quarter bushel. They also sell them already picked, but prices are higher. Romero's has over 330 trees and varieties such as red delicious, Winesap, Red Rome, and more. They also have pears, peaches, plums, and several varieties of apricots. They accept cash and checks only. Heading out to Wagner Farms in Corrales is an experience and one that can't be missed during the harvest season. Yes, they have apples, and so much more, like a pumpkin patch, chile roasting, hayrides, a petting zoo, and a corn maze. Apples and other fruits can be purchased at the Farm Stand, but if you have kids, plan to spend the better part of the day there.